Bert Peal was teetering on an emotional brink after his best friend, Bullett, a Weimaraner, passed away. The Byron, GA, man has renal disease, a condition he has had since birth. For forty-some years he has coped with the disease and a prediction cast over him when he was a child that he wouldn’t live long. His dog helped him cope — and then Bullett died. He was crushed. “The next business day, I told my boss that I needed to retire for medical reasons,” Bert says. About a year later, he pulled himself together enough to look on Petfinder for a new pet. 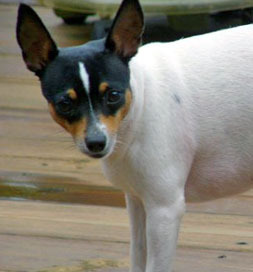 Georgia Canine Rescue and Rehabilitation in Cochran, GA, had recently taken Ladybug, a Toy Fox Terrier, from animal control, which had picked her up as a stray. Later they learned she had belonged to a dog breeder, but when the people went on vacation and left their dogs untended, she had escaped and lived on her own for several weeks. Ladybug has been with him for six years now. “My dialysis machine beeps loudly when I wake up and start the disconnect procedure,” he says. The sound brings Ladybug running to his side, and together they face the day and whatever it brings. “She rescued me every bit as much as I rescued her,” he adds. They both were in need and came together at just the right moment.